There is a new attraction in Vancouver that you won't want to miss on your next visit. Celebrating the incredible diversity and beauty of Canada be sure to visit FlyOver Canada at Canada Place. 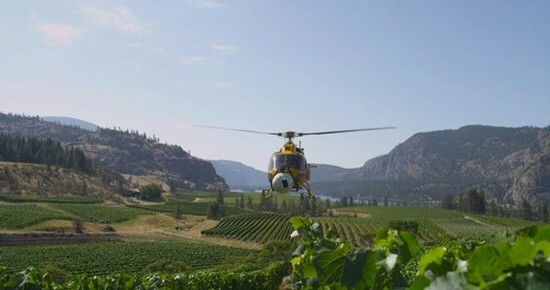 You might even recognize a certain Okanagan Falls Winery! Buckle up your seatbelt and prepare for the flight of your life! FlyOver Canada incorporates state-of-the-art technology to bring you some of Canada’s most thrilling sights like you have never seen them before. You will hang suspended, feet dangling, immersed in a huge 20m spherical screen while our film takes you on a thrilling journey from east to west across Canada. FlyOver Canada and our production team from Sherpas Cinema spent over a year travelling from coast to coast capturing some of Canada’s most spectacular locations. Special effects like wind, mist and scents combine with the ride movement to create an incredible experience. Dip into deep valleys where wild rivers rush by. Feel the wind in your hair as you fly over magnificent prairies. Gaze at snow-capped mountains that tower over the land. Seek the thrill of urban environments that buzz from morning to night. By the end, you will find yourself in awe of this amazingly diverse country. This incredible journey of discovery covers over 6000 kilometers from coast to coast, all the while never leaving Vancouver! It is unlike any ride experience you will find anywhere in Canada. We can’t wait to see you! On Sunday, July 7th, 2013 approximately 2700 cycling enthusiasts and racers will take to the roads in the South Okanagan to complete a race that is fast becoming a must do on any cyclist's bucket list. Weaving through beautiful lakeside vistas and lush orchards and vineyards the Valley First Granfondo is now in its third year and is drawing participants from all over North America. If you are not participating cheer on the riders from any of the magnificant vantage points along the route. Here is a video clip of the section of road near Blue Mountain that the Granfondo riders will cruise along before stopping for lunch at Le Vieux Pin. Cyclists leaving the starting point near Okanagan Lake heading towards Skaha Lake. Here is the full route including some information on road closures for those of you still wanting to get out and tour some local wineries.